This hidden oasis makes you feel like you are in your own private paradise as soon as you enter the plot. It really is beautiful with its slick construction and wonderfully landscaped gardens. It really is a sight to behold. The villa, which is set over three floors, has stunning views over the terraced gardens and the River Nabao as well as the surrounding countryside. It is situated in a quiet, rural location yet close to all amenities. It is connected to mains water and electricity, has central heating, air conditioning and is fully double-glazed throughout. From the dead end lane, there are remote controlled gates at the entrance of the property, which allows easy access to cars, meaning they can be stored directly into the garage upon arrival. The ground floor accommodation is effectively a self contained apartment. Inside there is a fully fitted Kitchen as well as a very large open plan dining and lounge area. The Lounge has a traditional log fire installed. Two rooms have been converted to add extra bedrooms (making 6 in total), one with an en-suite and direct access out onto the pool area. The main living area has an entry door plus a double window above the sink and also a quadruple set of folding French Doors making it extremely light. There is also a good-sized Utility Room currently used for storage but with plumbing facilities installed for a washing machine. This space is ideal for allowing friends and family to have some independence when visiting or even if you wanted to explore the rental market. On the first floor there are two entrances, the first is to the front of the house, where there is a large entrance hallway fitted with two sliding door, oak wardrobes. The second entrance is to the rear via the kitchen. From the front hallway you enter, via an archway, the open plan Living and Dining room. The living room is fitted with Air Conditioning, a sealed log burner that expels hot air into the room automatically and has a lovely wooden floor. The dining area has double French doors allowing access to a veranda, where garden furniture can be located. From the dining area you can access the kitchen via a lovely stone archway. The main kitchen has purpose built tall cupboards to accommodate a fridge/freezer as well as an integrated dishwasher, a 5 ring gas hob, extractor and integrated microwave and oven. There are a number of other base and eye level oak units fitted. Here there is also a beautiful marble topped island which sits proudly in the middle of the room. The Kitchen is double aspect with a double window and two French doors allowing plenty of natural light to enter. The rear door that is in the kitchen, allows access to a long veranda that overlooks the swimming pool and upper gardens. Steps take you to the pool and garage areas. Also on this level there is a room currently being used as an office. This room has double French windows leading onto a covered veranda. There is also a WC room fitted with a hand basin and storage unit. On this floor there is a large double bedrooma with an en-suite and the bedroom has dual aspect double windows and oak parquet flooring. On the third floor there are a further three very good sized double bedrooms. The first one is currently being used as a crafting room/dressing room with open access to the main bedroom. It has double windows overlooking the whole terraced garden. Oak parquet flooring. Bedroom number 2 has double French doors leading to a covered veranda at the rear of the property, it has air conditioning, oak parquet flooring and an en-suite. The en-suite room comprises a bespoke double sized shower area, toilet, bidet and wash hand basin. Bedroom number 3 also has access to a large veranda at the front of the house via two French doors. At the top of the stairs there are two more built in wardrobes. All three top floor bedrooms have double sized, built in oak wardrobes. On this floor there is also a seperate toilet. The villa is set on a plot measuring 3080 square metres, two sides of which are fenced and covered with green shrubs, the front garden is walled and the river Nabao forms the lower boundary. The middle terrace is grassed and has a large viewing platform where you can look over the gardens and river. There is a larger lawn by the river with a willow tree to provide shade. 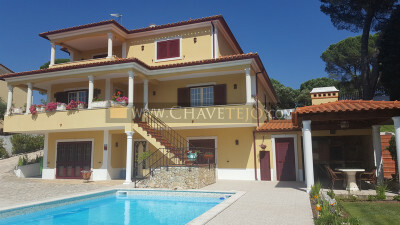 The swimming pool is 11 x 6 metres and is situated to the rear of the villa. The spacious patio area surrounding the pool has recently been covered entirely with non-slip tiles and there is a substantial gazebo offering welcome shade on sunny days. The pool is situated next to the upper gardens, which provide plenty of colours throughout the year. The BBQ area is a purpose built, roofed structure also containing a sink and a wood fired oven. In front of the double garage is a large patio area where additional cars can be parked if required. A pontoon is situated next to the river, where you can launch a canoe or do some fishing. The gardens surround the property and have been impressively constructed to show off the wide variety of flowers, trees, shrubs and plants. There are a variety of fruit trees including Fig, Clementine, Orange, Pomelo, Lime, Olive, Plum, Pomegranate and Cherry. There is also an additional area, using raised beds, for growing vegetables and salads. There is a separate machine room containing the heating oil tank, central heating combination boiler, automatic irrigation controls and the pump controls for the swimming pool. Irrigation water is supplied free using a submersible pump in the river. The property is situated near the village of Quinta do Falcao, which has two restaurants/cafes/bars and a small RC chapel. Castelo do Bode Lake, Portugals second largest reservoir is less than a 10-minute drive from the property. This lake is popular for all kinds of water sport activities including swimming, sailing, canoeing, scuba diving, wind surfing and water skiing. The property has excellent motorway links via the A13/A23. A 10-minute drive takes you to Entroncamento railway station, where fast intercity trains can be taken to Lisbon, Porto etc or take the slower regional trains from either Tomar or Santa Cita stations, which are less than 10 minutes away. Tomar is a bustling market town, which has a good variety of supermarkets, cafes, restaurants, banks, shops, pharmacies, health centres, sports centres, library, university, hospital, bus and train station, historic monuments and parks, all of this is only 10 minutes away. The house is about 50 minutes from the Silver Coast beach resorts and 2 hours to the Serra da Estrela, Portugals highest mountains and ski area. The closest airport to the property is Lisbon, which is around one hour by car.